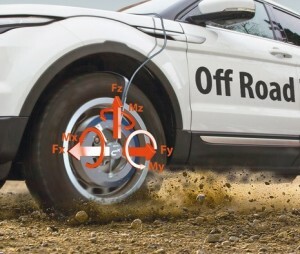 In the development process of motor vehicles of all kind 6 components Wheel Force Transducers (WFT) are applied, by means of which all relevant loads on the wheels, being the 3 forces Fx, Fy, Fz and the 3 torques Mx, My, Mz, can be determined and recorded at real test runs on the road, proving grounds or even off road. The results of such measurements can be used as a basis for computer simulations or serve as input parameters for runs on a roller-bed test-rig. 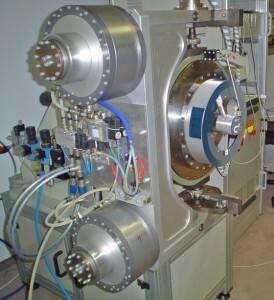 The measurement principle of traditional WFTs is based on a complex circuitry of numerous strain gauges (up to several dozens of them) arranged in the measurement sensor. Due to the innovative concept of a widely digitized signal processing the new WFT-CX requires substantially fewer strain gauges than comparable systems. The traditional noise sensitive analogue treatment of strain gauge signals is now replaced by digital online computing with an internal resolution of 24 bit (16 bit for transmission and analogue reproduction). This results in a much higher dynamic of the measuring signals, which allows for so called comfort measurements as well as measurements on impassable grounds. The signal processing in total is designed to guarantee an utmost accuracy in data logging widely free of noise and disruptions. This could be achieved by extremely short wiring, an optimized placement of the strain gauges and through digitization very close to the test points. The fully differential input circuits of the amplifiers associated with the bridge supplies provide for the highest possible noise reduction. Additionally, thermal sensors properly distributed inside the WFTs allow for an optimum temperature compensation. Together with the high incremental angle resolution of 0.072°, this guarantees for the best possible accuracy. Furthermore the intelligent measurement amplifiers provide a self-diagnosis of the measurement points and are capable to detect for instance a broken wire on a sensor automatically. In test runs the measurement sensor is exposed to extreme stress which results in unavoidable deformations. 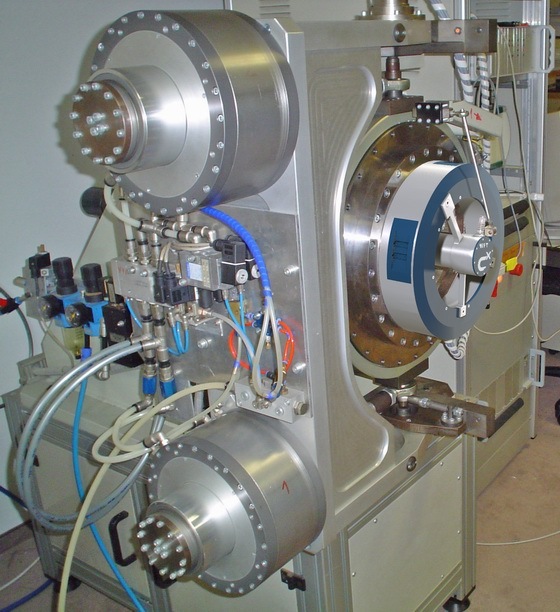 Therefore mechanically caused non-linearity requires an exact calibration on a custom-built test bench. The test and calibration bench at CAEMAX (see picture) has been extended correspondingly to enable the company to offer an optimal calibration of the new WFT sizes too. In the first place the non-linearity of the six physical variables Fx, Fz, Fy, Mx, Mz and My and then their influence on each other (so called “crosstalk”) are determined. For each wheel a total of 36 line graphs are recorded which then are integrated into the automatic linearization and crosstalk compensation. With the information determined this way each WFT gets its own electronic profile with all calibration and correction data that is required for an exact online computation. Finally this procedure results in a remarkably better data quality compared to systems currently available. The micro processors and the intelligent firmware employed do not only provide linearization and crosstalk compensation, which are essential for any WFT, but beyond that an alignment at lightning speed. So the alignment, which is necessary before every test run, is achieved within 2-3 turns of the wheel only. Additionally, after assembly of the measuring hub the exact orientation in x-, y- and z-direction is automatically made with aid of the gravitational acceleration. As a result of this the manual orientation employing a water-level therefore belongs to the past. Further demands to guarantee a highly efficient application of the newly developed WFTs were easy handling and quick assembly. At the WFT-CX the stator electronic can easily be demounted from the wheel which enables technicians to balance the wheels on standard machines and to apply conventional screwing tools. 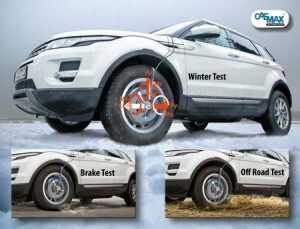 A further advantage achieved by the modular design of the complete measurement sensor is that it is possible to manufacture hub and rim adapters, which are required for mechanical adaptation to particular types of vehicles and wheels, separately – if desired even directly at the user’s facility. Besides that the emergency running properties were improved significantly. In case of a mechanical crack due to overload, the gear cutting between the inner and the outer ring of the measurement sensor at least allows to drive on in most cases. The contactless digital transmission of the measurement data from the rotating wheel to the stator is done via infrared short-range telemetry. From there a cable bar leads to the control unit in the interior of the vehicle. Regarding the interfaces the new WFTs are fully compatible with their predecessors. So already existent measurement systems can be used along with the new ones. For the whole signal control and reproduction the measurement system MOPS Evolution and the data logging software RemusLAB from CAEMAX are available. Only one MOPS-TTI controller plug-in unit can operate two WFTs at the same time, that means to handle the measurement data of all 4 WFTs requires a control unit with dimensions of ½ 19 inches MOPS housing only. So there will be enough place to plug in additional MOPS signal conditioning modules to acquire many more measurement variables inside and outside the vehicles simultaneously, such as temperatures, revolution speeds, forces, angles, paths and many more. Standard interfaces like CAN or Ethernet furthermore provide flexible processing of the measured data. The application of the new WFT-CX ranges from small cars (minimum rim diameter: 14 inches) up to big limousines, but particularly covers also SUVs and light trucks (maximum diameter of the hub: 5,5 inches). Apart from the waterproof design the shock resistance up to 50g (g being the gravity acceleration) is essential, which for the first time allows for experiments with drives over heavy bumps (“speed bumps”). The overall design of the WFTs being optimized in view of heat conduction and cooling avoids an extensive heat development even in case of full breakings. Just one example: After 20 full braking runs from a speed of 150 km/h, the temperature of the WFT even in this case did not exceed 50°C. The design of the whole signal processing covers a temperature range from -40°C to +105°C. Compared to the past, all these points lead to an enormously widened scope of possible applications which now include break, comfort and tire tests with just one WFT configuration.